In modern home design, the appearance of a home’s exterior commands as much admiration as its interiors. What is inside of a house is reflected by what is seen outside. Because of this, the focus shouldn’t only be placed on interior design. The first things someone sees from the street, after all, is the outside appearance of a house. Well kept exteriors leave a positive impression on anyone who lays eyes on it. Enhancing the curb appeal and backyard of your home calls for the assistance of decorative concrete. Here are decorative concrete ideas for modern home exteriors. It’s no secret that concrete driveways are prone to cracking and other superficial damage because of daily vehicle traffic. 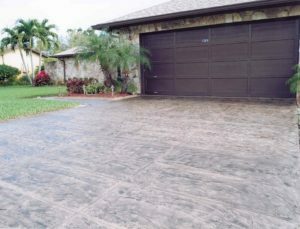 A concrete driveway shouldn’t just be pleasing to the eyes, it should be durable as way. Modern home designs call for a smooth surface all throughout the driveway with minimal details. Custom scorelines are a great way to achieve this. Not only does it add subtle accents to your driveway, but it’s also designed to hide the concrete cracks. By using a custom-cut concrete pattern, custom scorelines incorporate the existing cracks into the design. Patios in modern home design veer towards a clear, urbane and polished look. Functional concrete structures are installed to maximize the use of the area. Especially for backyards with limited space. Adding color to outdoor furniture is also an option. For outdoor floors, stained concrete gives a lustrous tint that breathes life into the whole area. Concrete staining can be done with one color all throughout. On the other hand, stencils can also be used to add an image or a pattern for a striking effect. Most people don’t pay much attention to their walkway. However, the walkway part of the facade of the house. The look of a walkway has to be well-kept in order to leave a good impression on neighbors and visitors. With concrete stamping, a variety of styles can be achieved to improve it. You can either go for subtle detailing or a patterned look all throughout. 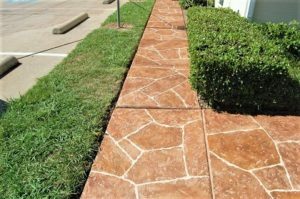 Either way, concrete stamping adds detail and texture to your walkway. This gives off a put together look that complements the house perfectly. The look of the pool deck is one of the visual elements that really define an entire pool area. Pool decks are also in a demanding environment. It is constantly exposed to varying weather and gets frequently wet from regular use. Algae and mold overgrowth is something to watch out for as well as slip hazards. To enhance the look and functionality of a pool deck, spray applying a spray knockdown texture is one of the best methods. You can choose from a variety of colors. The texture not only adds to the visual appeal of a pool deck, but it also creates a skid-free surface. 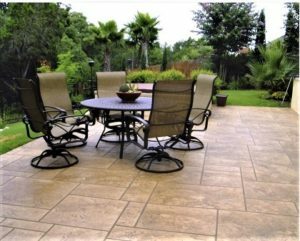 For more information on decorative concrete in Chicago, visit our homepage and you’ll find everything you need.